A freed Palestinian prisoner hugs a relative after his arrival in the West Bank city of Ramallah last month. In August, The Associated Press reported that Israel published the names of 26 men to be freed before the latest peace talks between the Jewish State and the P.A. In all, 104 prisoners have been slated for release in four phases over a period of nine months that the U.S. has set aside for negotiations. But their freedom is reportedly contingent on progress in the talks. It’s not clear who exactly has applied for the “Dignified Life Grants,” although Palestinian Media Watch reports that prisoners released from Israeli prisons swarmed the P.A.’s Ministry of Prisoners’ Affairs office in Gaza following the grants’ announcement. And among those Israel was slated to release was Mustafa al-Haj, convicted of killing an American-born settler hiking in the West Bank in 1989. “It’s not certain our specific dollars are finding their way into terrorists’ or former terrorists’ pockets but – at the least – it’s freeing funds for the P.A. to do these types of things,” Jim Phillips, Middle East analyst at the Heritage Foundation, a Washington, D.C.-based conservative think tank, told FoxNews.com. Andrea Lafferty, president of the Traditional Values Coalition, a national conservative organization, turned up the rhetorical heat a few degrees further, telling FoxNews.com, “The Israelis were wrong to release these murderers and Obama is wrong to pay them a bonus for their evil actions. No good can come with any cooperation with the Palestinian Authority. During the Vietnam War, the U.S. military sprayed 20 million gallons of chemicals, including the very toxic Agent Orange, on the forests and farmlands of Vietnam and neighboring countries, deliberately destroying food supplies, shattering the jungle ecology, and ravaging the lives of hundreds of thousands of innocent people. Vietnam estimates that as a result of the decade-long chemical attack, 400,000 people were killed or maimed, 500,000 babies have been born with birth defects, and 2 million have suffered from cancer or other illnesses. In 2012, the Red Crossestimated that one million people in Vietnam have disabilities or health problems related to Agent Orange. The savage violence of the police against Occupy protesters in 2011 was well documented, andincluded the use of tear gas and other chemical irritants. Tear gas is prohibited for use against enemy soldiers in battle by the Chemical Weapons Convention. Can’t police give civilian protesters in Oakland, California the same courtesy and protection that international law requires for enemy soldiers on a battlefield? Some people wonder whether there is a link between the Ghouta massacre in Damascus committed by the Assad regime and the massacre committed by Abdel Fattah Al-Sisi in the Rabaa Al-Adawiyya and Al-Nahda Squares. Yes, there is; it is the same brutal and cowardly hand that wants to violate our countries. This hand is not concerned by the blood that flows; it is only concerned with clinging to power at any cost. It is not moved by the tears of children, the cries of the mothers who have lost their babies, the pain of bereaved wives who have lost their husbands and sole providers, or the mourning families. Such things do not move the thugs’ consciences. Sadly, the thugs are being helped and encouraged by unjust forces in the world which go against the teachings of Islam and Muslims. Such people refuse to allow Muslims to be in government and have been joined by some Arab states which claim to govern in accordance with the book of God and the teachings of His Messenger, all the while ruling with tyranny and corruption. They fear that the revolution will reach their countries and shake their thrones so they have made a deal with the Zionists in America and Israel to overthrow the Islamic regime in Egypt and prevent the Islamic project in the region. They are doing the same in Syria, even though they claim to support the Syrian Revolution and are demanding the overthrow of Assad; in truth, they support the brute. Ask the Director of Saudi intelligence, Bandar bin Sultan, who sent his representatives to the regime in Damascus with funds to buy weapons from Russia in order to turn the situation into a civil war. Forget about his statements calling for a US strike to overthrow the Assad regime rather than it being “limited”, which is what Obama wants. The US president is happy to see the dictator stay in power and even increase his strength. Unless he is removed, Assad’s popularity will grow because he will be seen as a hero who stood up to the US; the people will forget about the Ghouta massacre, along with the other crimes he has committed over the past two and a half years. This is exactly what they did with Gamal Abdel Nasser in 1956 and Saddam Hussein in the nineties; the scenario is being repeated, with tyrants turned into heroes for a while, until the West deems that they have served their purpose. In Assad’s case, he hasn’t fully destroyed Syria yet, so they will keep him in power until he has completed the job. The same can be said for Egypt and Al-Sisi, whose personality was studied carefully by US intelligence, as happens with all of their agents. They know that he is a man with a lust for power and authoritarianism; this was confirmed by the US delegation which visited him post-coup. He was chosen over others to carry out America’s plans in Egypt, so his image has been polished and he is described as a strong man. Moreover, the media has compared him to Nasser to appeal to the nostalgia of Arab nationalism and hostility towards Israel, as well as all the other false dawns promoted by Nasser, Hafez Al-Assad, Saddam Hussein and Muammar Gaddafi until they settled on Basher Al-Assad. Like father like son, Assad the younger has never fired a shot in anger against Israel despite it occupying Syrian land for more than 30 years. Instead, the Assads have acted as guard dogs for Israel’s security agencies, along with that other “strategic treasure” Hosni Mubarak in Egypt. That came to an abrupt halt with the election of Mohamed Morsi as president in Egypt, which is why he had to be removed and replaced by someone, Al-Sisi, who fits the bill as a US-Israeli stooge. There is little or no difference between Bashar Al-Assad and Abdul Fattah Al-Sisi; they are two sides of the same coin that only has value in the Zio-American market, which now covers Saudi Arabia, the UAE and Egypt. So the struggle has to go on, and the people of Egypt and Syria will not rest until they defeat the forces of oppression and rid themselves of Assad and Al-Sisi, each part of the same brutal hand of corruption. HEBRON (Ma’an) — Israeli forces detained over 30 Palestinians in a refugee camp near Hebron early Saturday after a firebomb was hurled at a military tower. Israeli forces escorted dozens of young men and children from the al-Arrub camp in the raid, local popular committee spokesman Ahmad Abu Khayran said. “We still don’t know the exact number of detainees, because from time to time the Israeli forces release a few of those detained since dawn,” Abu Khayran told Ma’an. Earlier, a firebomb was thrown at a military tower near the camp in the southern West Bank, setting it on fire. Witnesses said Israeli soldiers ransacked dozens of homes, breaking doors and beating residents before taking dozens of handcuffed men and children out of the camp. They detained 32 suspects at the scene, who were later released, the army spokesman told Ma’an. Three Palestinians were arrested and transferred to Israeli police custody for questioning, he added. Locals confirmed to Ma’an that all detainees were released, except for three who they identified as Muhammad Abu Afifeh, Muhammad Jawabra and Khalid Jawabra. HEBRON, September 7, 2013 (WAFA) – Israeli soldiers raided early Saturday Arroub refugee camp, north of Hebron, and spread terror in the camp when they ordered hundreds of people out of their homes and kept them out for several hours, according to local and security sources. The soldiers broke into homes shortly after midnight, forced people to go outdoors while they searched homes destroying furniture and trashing personal belongings in the process. The residents ordered to stay at the entrance of the camp until around five in the morning before they were allowed to return to their damaged homes, Abdul Lafit Abu Safieh, director of the camp, told WAFA. He said the soldiers also threw tear gas grenades and stun bombs at the homes as they were leaving the camp. No one was reportedly arrested in this campaign, whose reasons were not known. While the mainstream media admonishes John McCain for playing a poker game on his iPhone during the Senate Committee on Foreign Relations hearings on Syria last Wednesday, no one seems to have noticed that the Republican Senator has, for several years, been supporting and mingling with Al Qaeda commanders in the field in blatant violation of international law as well as in breach of US anti-terrorism legislation. One of the rebels’ leading figures was Abdel Hakim Belhaj (picture below), a member of the defunct Libyan Islamic Fighting Group LIFG), a terrorist organization on both the UN Security Council and the US State Department lists. 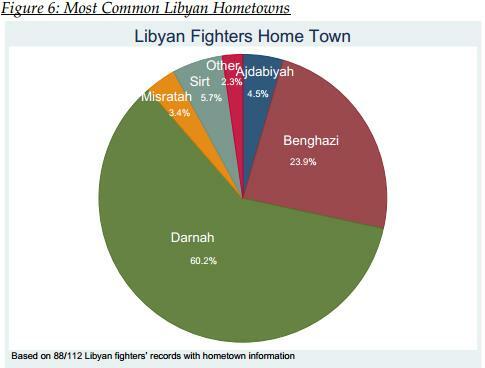 The vast majority of Libyan fighters that included their hometown in the Sinjar Records resided in the country’s Northeast, particularly the coastal cities of Darnah 60.2% (53) and Benghazi 23.9% (21). Both Darnah and Benghazi have long been associated with Islamic militancy in Libya, in particular for an uprising by Islamist organizations in the mid‐1990s. The Libyan government blamed the uprising on “infiltrators from the Sudan and Egypt” and one group—the Libyan Fighting Group (jamaʹah al‐libiyah al‐muqatilah)—claimed to have Afghan veterans in its ranks.14 The Libyan uprisings became extraordinarily violent.” (Joseph Felter andBrian Fishman, Al Qaeda’s foreign fighters in Iraq, US Military Academy, p.11-12, December 2007). 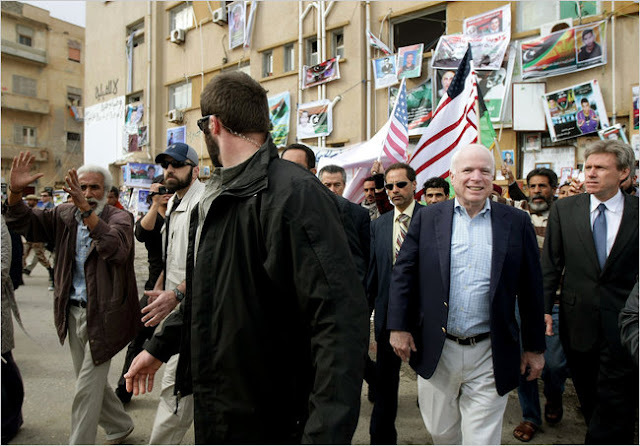 McCain called on all nations, especially the U.S., to recognize the National Transitional Council in Benghazi. He said some of the Gadhafi regime’s frozen assets should be redirected to the rebels and the U.S. should facilitate the delivery of weapons to rebel fighters. He clarified that by facilitate he meant not directly arming the rebels, but ensuring that they receive weapons as the U.S. did in the 1980s with the mujahideen battling the Russians in Afghanistan. In requesting weapons for the Libyan and Syrian rebels which clearly have ties to terrorist organisations, Senator John McCain is supporting terrorism. 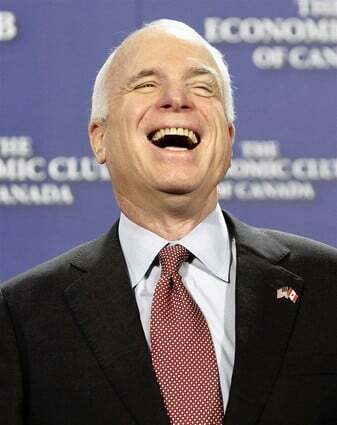 Senator McCain met with terrorists in Libya and Syria, has called for his country to provide weapons to terrorist groups in Libya and Syria and should therefore be prosecuted for the assistance he provided them with. There is ample evidence that the armed groups supported by John McCain have committed horrible terrorist acts, which resulted in deaths. According to witnesses, McCain’s Syrian “heroes”, have, among other atrocities, been blamed for the Houla massacre in 2012. Is it “politically correct” for a US Senator to mingle with leaders of a terrorist organization, while at the same time paying lip service to the “Global War on Terrorism”? While this may be “business as usual” for the US Secretary of State, American servicemen and women are now “refusing to fight” [see image below] a war in favor of terrorism under the emblem of the “Global War on Terrorism”. Those who refuse to fight “Obama’s War in support of al Qaeda” are America’s heroes. In contrast, John McCain’s “heroes” are known to be or have links to terrorist organisations designated by the US State Department as Foreign Terrorist Organizations, such as the Libyan Islamic Fighting Group (LIFG) and Al-Nusra now fighting against the government of Bashar Al Assad in Syria. These actions are far more scandalous than slacking on the job playing poker on a cell phone. Yet, this is what makes the news: focus on what is irrelevant and trivial while excluding the “forbidden truth” on the criminal nature of US foreign policy. Tens of thousands of Tunisians have marched on the seat of the elected assembly demanding the government resign in one of the largest opposition protests to date. Saturday marked 40 days since the assassination of opposition politician Mohammad Brahmi, whose killing has plunged the country into a political crisis. Dozens of opposition members of the assembly withdrew from the body, paralyzing its work of writing the country’s new constitution. Weeks of mediation between the government and the opposition by the main labor union have not borne fruit. 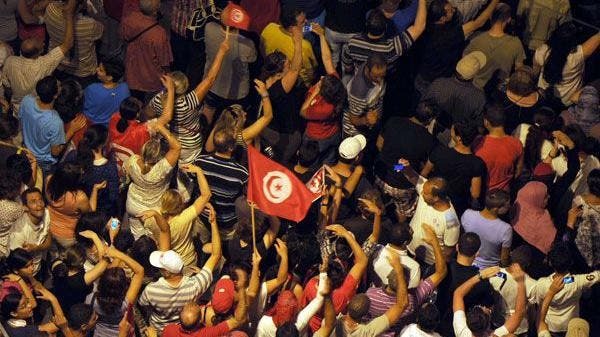 The opposition is demanding the Islamist-led government resign for what they say is its failure to ensure security or manage the economy in Tunisia, the birthplace of the Arab Spring. 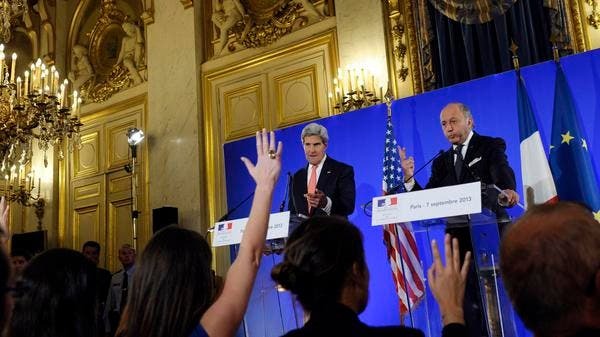 U.S. Secretary of State John Kerry and France’s Foreign Minister Laurent Fabius (R) hold a news conference at the Ministry of Foreign Affairs in Paris September 7, 2013. The United States and France said Saturday that international backing was growing for military strikes to punish the Syrian regime for alleged chemical attacks, after European Union nations called for a “strong” response. U.S. Secretary of State John Kerry said the number of countries ready to take military action was now in the “double digits,” after earlier attending a meeting where EU foreign ministers united to call for action against Syrian President Bashar al-Assad’s regime. “I was encouraged by the statement the EU gave,” Kerry said in Paris at a joint press conference with French counterpart Laurent Fabius. The U.S. accuses the Assad regime of gassing more than 1,400 people to death in an August 21 attack outside Damascus. In his weekly address, U.S. President Barack Obama warned of the dangers of turning “a blind eye” to chemical attacks. “I call on members of Congress, from both parties, to come together and stand up for the kind of world we want to live in,” the president said after returning from a G20 summit in Saint Petersburg, Russia that deadlocked over the response to the Syria crisis. Obama has asked for Congress to authorize strikes on Syria. The legislature reconvenes Monday and the president is set to address the nation Tuesday about the U.S. response. Kerry meanwhile sought to whip up support from Washington’s divided allies in Europe, holding talks with the EU’s 28 foreign ministers in Lithuania and with Fabius in France before heading to Britain on Sunday. Fabius told reporters after their talks that there was “wide and growing support” to take action on Syria. “Right now, seven of the eight countries in the G8 share our opinion on a strong reaction and 12 countries of the G20 also share this opinion,” he said. Split between Paris and London, who are hardline supporters of U.S.-led military action, and smaller nations reluctant to act without a United Nations mandate, the EU ministers managed to hammer out a compromise in Lithuania. 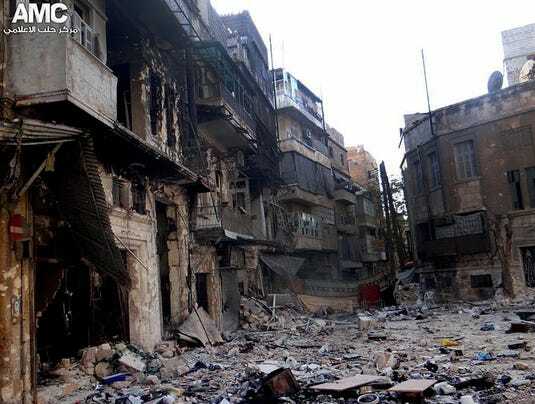 There was “strong evidence that the Syrian regime is responsible,” the statement said. Faced with a war-weary U.S. public and little international support, Obama is bracing for an uphill battle to convince American lawmakers to back military action against Assad’s regime. The Senate and the House are expected to vote on the issue within the next two weeks. In France, the sole EU nation determined to join a U.S.-led strike, the latest public opinion poll showed 68 percent of people opposed to military action, an increase of nine percentage points since late August. The EU statement said there could be no end to the Syrian war without a political solution and urged the UN Security Council “to fulfill its responsibilities,” a reference to Russia and China’s repeated refusals to sanction Assad. Ashton meanwhile said the EU welcomed French President Francois Hollande’s decision to await the release of a U.N. investigation into the August attack before taking action against Syria. French President Francois Hollande said he expects the report to be ready by next weekend. But Kerry made clear that Washington had not decided to postpone a decision on military action until the release of the U.N. report, though several EU ministers said he had pledged to make their case to Obama. Washington meanwhile is evacuating non-essential embassy staff from Beirut and urging Americans to avoid all travel to Lebanon and southern Turkey. PARIS (AFP) — US Secretary of State John Kerry said Saturday that many countries were prepared to take part in US-led military strikes against the Syrian regime. “There are a number of countries, in the double digits, who are prepared to take military action,” Kerry said at a press conference with French counterpart Laurent Fabius. The Britain-based Syrian Observatory for Human Rights said the mortar and artillery fire on the Moldokhiya agricultural area south of Damascus, Syria killed 14 rebels and two civilians. BEIRUT (AP) — Heavy government shelling of rebel positions near the Syrian capital killed 16 people on Saturday, activists said, as U.S. Secretary of State John Kerry lobbied European allies to back Washington’s proposed military action against the ruling regime. The Britain-based Syrian Observatory for Human Rights said the mortar and artillery fire on the Moldokhiya agricultural area south of Damascus killed 14 rebels. Two civilians, including a child, also died in the shelling, it added. The group also reported heavy fighting between rebels and troops loyal to President Bashar Assad around the Christian village of Maaloula. The rebel advance into the area that began on Monday was reportedly spearheaded by al-Qaida-linked fighters, exacerbating fears among Syrians and religious minorities in particular that Islamic extremists are playing an increasingly important role in the rebellion. Fighters from the Western-backed Free Syrian Army have also participated in battles around Maaloula, destroying two government checkpoints near the town earlier this week, according to a statement by the main opposition coalition on Friday. The fighting comes as President Barack Obama’s administration presses ahead with efforts to win congressional backing and international support for military strikes against Syria over a chemical attack in August outside Damascus. The Obama administration says Assad’s forces fired rockets loaded with the nerve agent sarin on rebel-held areas near the capital before dawn Aug. 21, killing at least 1,429 people. Other estimates put the death toll in the attack at more than 500. Kerry is in Lithuania to meet with European foreign ministers later Saturday. European officials have been skeptical about whether any military action against Assad’s regime can be effective. They are expected to urge the U.S. to hold off on any strike in Syria until United Nations inspectors report on the alleged use of chemical weapons. The U.N. inspectors’ report is expected later this month, although some European officials are asking the U.N. to speed up the probe or issue an interim report. The prospect of a U.S.-led strike against Syria has raised concerns of potential retaliation from the Assad regime or its allies. On Friday, The State Department ordered nonessential U.S. diplomats to leave Lebanon over security concerns and urged private American citizens to depart as well. The Shiite militant group Hezbollah, an Assad ally that has sent fighters into Syria, is based in Lebanon.